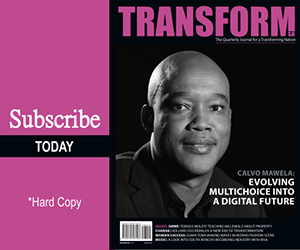 “Transform SA” is a business to business quarterly publication. The magazine disseminates information relating to socio-economic transformation within the private and the public sector. The editorial content of this highly sought after publication is driven by the ever-changing business and government environment in concert with the passion to educate the South African citizenry about the transformation in the context of South Africa especially for economic growth and the advancement of underprivileged communities. With this in mind Transform SA interviews individuals that were and are involved in South Africa’s transformation journey with a view to encourage the vision of all South Africans working together while providing a well rounded review on the success of transforming businesses. This journal celebrates success stories of transforming companies through interviews with the men and women driving these organizations which have contributed immensely to South Africa’s transformation. Transform SA speaks directly to decision-makers across the SADC region regarding SA’s transformation in terms of management, policies and strategic direction in the public and private sector. Well researched editorial content gets contributed by industry specialists, business analysts and some of the best business leaders, political analysts and politicians in Southern Africa. JSE listed companies, associations, chambers of commerce, decision makers in national and provincial government departments, municipalities, members of various diplomatic corps, captains of industry, think-tank organizations, local and international embassies, academic and research institutions, policy units, NGOs, the international development community, verification agencies, first class and business lounges at major airports, all archived copies available on-line.